We love the French Luxury Trunk maker Pinel et Pinel, it appears at a first glance to be some sort of a Vuitton type reinvention of a decades or centuries old brand, in fact it is no more than 13 years old having been started in 1998 by Fred Pinel. They have quickly established themselves as a quirky an innovative little brand that produces trunks at the absolute highest eschelons of luxury. We thought we would show a few more of Pinel et Pinel’s creations. The ‘Music Centre’ trunk, opens to reveal 26 drawers for CD’s a space designed for the Bang Olufsen Overture Sound System and two spaces for Beolab 3 speakers. Two Varieties of Watch trunk, the one on the left is designed for jewellery and watches with a central winder area for 3 watches and 8 other watch slots, plus drawers for jewllery and accesories, the one on the right is more for watches only, featuring 14 watch areas, one extra central winder and drawers for accessories. The brompton bike case – simply that a case designed to fit a folded brompton bike. The home cinema case – 4 central drawers for DVD’s, a space for a beovision 17″ Television, 2 slots for beolab 3 speakers, one slot for a beolab 2 subwoofer, 2 slots for beolab 6002 tower speakers. (on the right) the mobile computer workstation – designed to hold a complete computer and all accessories for travel, has a slot for a desktop mac, keyboard, speakers and all other accessories. All prices for Pinel et Pinel cases are upon application, they are set to open an online store for their smaller accessories, but all trunks must be to order, reason being the price is dependent upon your specification of leather and sizing, they can supply anything from standard calf to Crocodile, Galuchat, Lizard, or whatever else your heart desires. 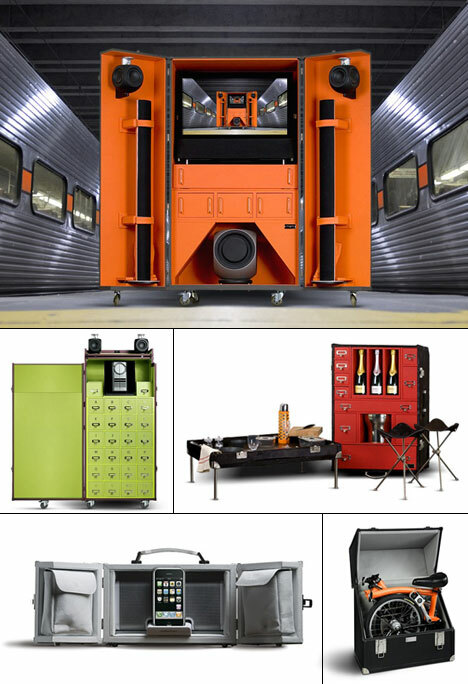 Pinel et Pinel’s ridiculously cool products transcend mere furniture; from luxe picnic sets to workstations, media cabinets to folding bike holders, the luxury trunkmaker manufactures a variety of experiences that all fold up into a box. Check out their website and dig, or hit the link below and see our convenient one-stop-peeping roundup.